It’s a new week, and for a second it looks like the markets were back to Euro selling as EUR/USD markets opened up and fell back below 1.29. However, it didn’t manage to hold as the Euro rallied across the board. This is probably a short term reaction to news that Barclays Plc won’t need further capital increases. The stop on my remaining position was hit and closed my remaining short position out at 1.3050. So, unexpected news took me out of my trade, but that’s how the game goes. This week should be another action packed week with Consumer Confidence and Case-Shiller Home Price Index tomorrow, and on Wednesday we’ll get the Fed’s rate decision. With rates so close to zero, we probably won’t see any further cuts by the FOMC. After that we have Jobless Claims, New Home Sales, and Durable Goods on Thursday and GDP on Friday. I have this funny feeling that GDP is really going to disappoint. My question is will it get priced in ahead of time? We’ll have to wait and see. For now, I will continue to watch EUR/USD and see if we get any resistance at the previous swing high around 1.33 – 1.34. Stay tuned! Closed half position at 1.2800 to lock in profits. Adjust stop on remaining position to breakeven (1.3050) to create a risk free trade. The Euro did rally at the end of the Euro/US session overlap – probably due to profit taking as we close out the week. I continue to hold my position into the weekend as I am still short-to-medium term bearish on this pair. Let’s see if 1.3000 is the magic resistance number in the upcoming week. Have a great weekend! Hey! Just wanted to post a quick update on my trade. EUR/USD rallied a bit higher since my original post, hitting a high around 1.3090 before sellers pushed the pair back below 1.3000. My short orders at 1.3050 were triggered and I entered my trade. Since then, the pair hasn’t really gone far in either direction and has made a low around 1.2910. This could be on the account of mixed of US data this morning, with better than expected unemployment claims and worse than expected housing data. I’m going to stick with the downtrend for now and that we may see more selling in EUR/USD on possible rate cuts to come from the ECB. it looks like this trade may take a while to play out. I will continue to hold this position until my exit points have been hit or there is a change in market sentiment/environment. Stay tuned for updates and adjustments! 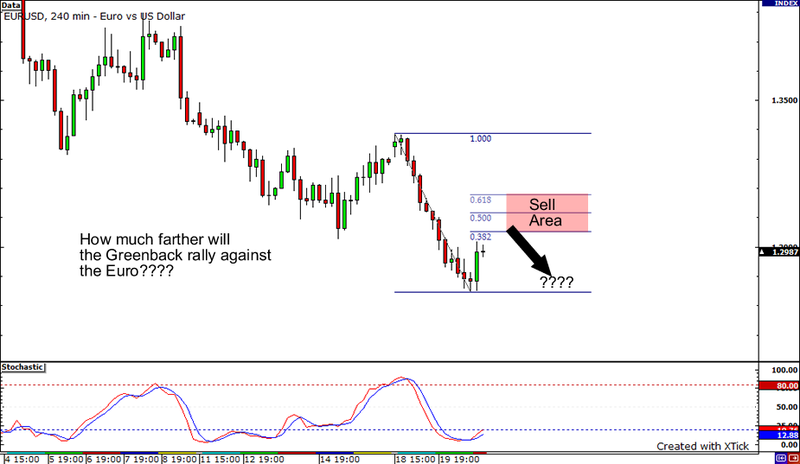 What’s up Forex fanatics! EUR/USD has been in a downtrend for a while, and it looks like I may have a chance to jump into the downtrend at a better price. The pair looks like it is taking a breather as it rallies. Time to sell the rally? Maybe so? Let’s take a look! Technically, I have a four hour chart, and we can see the pair retracing higher during its current downward move at the moment. Using the Fibonacci tool, I have picked out a possible resistance area in between the 38% and 61% Fibonacci retracement levels. Stochastics are showing oversold, so we may see buyers push the pair higher to more attractive sell prices. Fundamentally, it appears that market players are back into ‘risk aversion’ mode as higher-yielding currencies are falling to their lower-yielding buddies. Global recession is still the main focus and traders think that we will continue to see selling out of assets like commodities, equities, and high-yielding currencies for some time. It makes sense as it looks like some of the developed countries, or areas like the Eurozone, appear to be behind the curve in fighting economic slowdown. Look for more and more countries follow the US in fighting recessions with further interest rate cuts. In the upcoming list of calendar events, the big event is probably ECB President Trichet’s testimony to the European Parliament later today. His comments will be closely watched for hints on the next move from the European Central Bank. Stay tuned and good luck in your own trading endeavors!